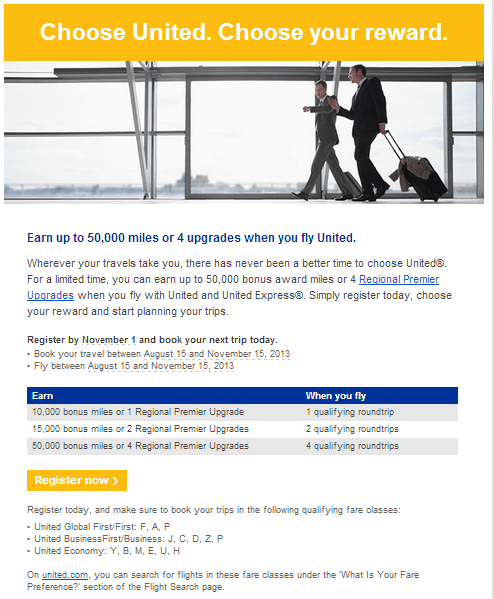 Last week United sent me an offer for either 50K miles or 4 Regional Upgrades. I’ve read that others received equivalent offers but most that I’ve heard about are maxing out at only 25K miles. Why did I get a greater promotional amount? God only knows – but the one thing I do know is that this is the first time in 7-8 years that I don’t have ANY United flights in the queue. Maybe United thinks I’m cheating on them and are trying to lure me back. The promotion grants either 10K miles or 1 Regional Premium Upgrade for flying 1 qualifying round trip, 15K miles or 2 Regional Premium Upgrades for 2 qualifying round trips and 50K miles or 4 Regional Premium Upgrades for 4 qualifying round trips. Seems pretty straight forward. The fine print is where they get you though. For economy tickets (I won’t even talk about First of Business class, because I’ve never purchased Business or First class tickets and I have no intention of starting now) you need to purchase a fare of Y, B, M, E, U or H. These are not the low cost tickets – and while I think this is a great promotion, I doubt I will actually earn anything as I usually buy the cheapest tickets. The other kicker is that when registering you have to select either the miles or the upgrades and you cannot change. Since I’ve got a TON of miles, I decided to opt for the Upgrades. This is a targeted promotion, but I say give it a try and see if you can register (maybe your email got lost, right??) – Register here. What option are you signing up for – Miles or Upgrades?